As a child, the French filmmaker Kamal Hachkar learned the Berber language from his grandparents in Tinghir, a Berber oasis city east of the Atlas Mountains in Morocco. As an adult he discovered that the now exclusively Muslim town once had a substantial Jewish community. In Hachkar’s film Tinghir-Jerusalem, Echoes from the Mellah: The Rediscovery of a Judeo-Berber Culture, which appeared at the New York Sephardic Film Festival this spring, Hachkar walks through Tinghir with his grandfather. They stop at a certain spot, and Hachkar asks the old man if this is where the synagogue was. It is there no longer: All that remain in the old Jewish quarters of this and other Berber towns are crumbled adobe walls, vacant lots, and once-Jewish stores now owned by Muslims. 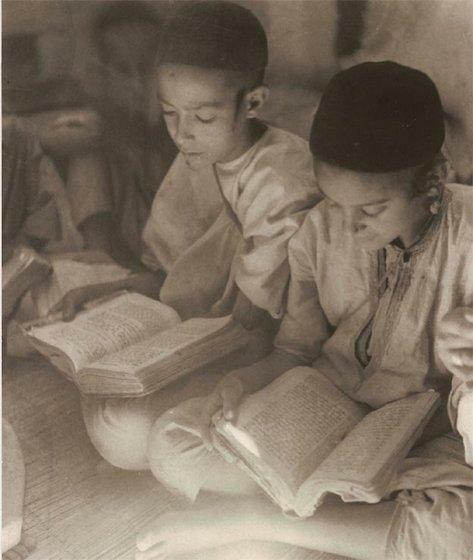 Morocco's Jews Mitchell Bard, Jewish Virtual Library. A community of a few thousand still remains. "The Terrible Voyage" Lela Gilbert, Jerusalem Post. First her father’s best friend vanished. Then one of her cousins also disappeared, never to be seen again. For Morocco’s Jews, such things weren’t exactly unusual. Jews and Berbers Bruce Maddy-Weitzman, Dayan Center. Today, apart from a minute number of elderly Berber Jews living in Israel, there are no more Berberephone Jews. Toward a Pluralistic Middle East Aryeh Tepper, Jewish Ideas Daily. From Morocco to Iraq, tracking the treatment of minorities like the Berbers and the Jews will be one way of measuring progress toward democracy. Jewish Berber Chants Tinghir-Jerusalem. In an video excerpt from Hachkar’s film, Jewish Berber women sing chants originating from Tinghir. Hachkar was told what other young Moroccan children are told if they ask about the vanished Jews, that the Zionists forced the Jews to leave their beloved villages and that the Jews left in tears. Intrigued, he follows the story to Israel, where he tracks down the elderly Jews who were uprooted from Tinghir. Tears flowing, the immigrants reminisce about their childhood homes and friends. They sing old Berber songs and sigh. Berber Jews from Morocco have not had easy lives in Israel. 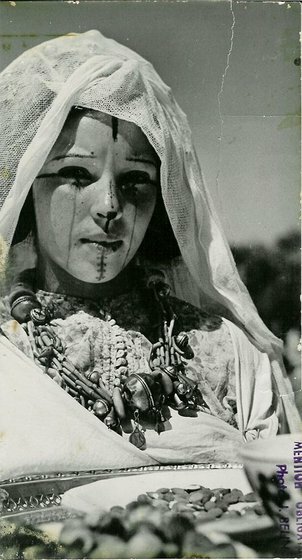 Jewish Berber woman with tribal tattoo, c. 1930. Courtesy of Juifs Berberes. But do they regret leaving? No—and not merely, as one Israeli-born daughter reminds her mother, because in Morocco the woman had to wash clothes by hand in the river. The Jews left because they had to leave. The Berber regions of Morocco were tribal and were not fully controlled by central authorities until well into the 20th century. Although Berber tribes understand themselves as extended families, descendants of a single, named ancestor, reality is more complicated. Families of slaves, former slaves, and survivors of defeated tribes can join a tribe as subordinate members. Berber Jews belonged to their tribes in this subordinate way. In the film, Hachkar walks the ruins of the abandoned Jewish quarter of a small Berber town as an elderly man describes the close friendships between the Jews and Muslims: The Jews of his tribe were like brothers, he says, and fought with the tribe to defend its territory. But when asked whether Jewish and Muslim young people could fall in love and marry, he recoils in shock. You can still see traces of the Berber Jews in the geometric, humanoid carvings on the gravestones in the old Jewish cemetery of Mogador, modern Essaouira. Berber Jews fascinated 20th-century French ethnologists, who came to study them and photograph Jewish Berber women, with their distinctive tribal jewelry, embroidered robes, and tattooed faces. But only a small percentage of Morocco’s Jews were Berber-speakers. Larger numbers of Arabic-speaking Jews lived in Fez, Marrakech, and other cities and spoke Jewish versions of their regions’ Arabic dialects. After 1492, they were joined by Sephardim expelled from Spain. For the next five centuries, the communities maintained their distinctive customs, languages, and synagogues. Traditional religious school, Tiznit, 1935. Courtesy of Juifs Berberes. It is easy to get nostalgic about Jewish life in Morocco—picturesque towns, wonderful food. Today, the few thousand Jews who remain, mostly in the business hub of Casablanca, have full citizenship. Jews are welcome to visit and run businesses. The government has a moderate attitude toward Israel. But Jewish life in Berber or Arab Morocco was never secure. This year is the centennial of the Fez Pogrom of 1912, a useful reminder that the history of the Jews in Arab North Africa was very like their history in other Christian and Muslim lands. Muslims saw Jews as inferior. Jews understood that they lived at Muslim sufferance. Jews could and did rise to great wealth and power in Moroccan society; but they had no rights, only such privileges as Muslim society and sultans chose to grant them. For centuries, they put up with what their neighbors dished out: petty humiliations, heavy taxation, occasional violence. The Jews of Fez responded to news of the first Zionist Congress in 1897 by establishing a chapter of Hibbat Zion (Lovers of Zion). In 1948, Moroccans responded to the creation of Israel with deadly pogroms in Oujda and Jerada. In a wave of Jew hatred over the next several years, Jews were kidnapped and murdered. They were not expelled, as in Algeria; but Morocco had become dangerous, and they began to leave. They went to France, Montreal—and Israel, because, for the first time in history, they had the opportunity to go home. Indeed, so many families immigrated to Israel that in 1956, King Hassan, fearing that other Arab states would blame him for allowing immigrants from Morocco to strengthen Israel, forbade the Jews to leave. After emigration was banned, Jews escaped clandestinely. On January 11, 1961, the Egoz, a small boat leased by the Mossad to smuggle Jews from Morocco to Gibraltar, capsized. All forty-four of the olim drowned, half were children. After the Egoz disaster, the Jewish Agency and the Mossad worked with threatened Moroccan communities to rescue the children first. In Operation Mural, 530 Moroccan Jewish children were sent by their families on an ostensible holiday in Switzerland—and, from there, flown to Israel. 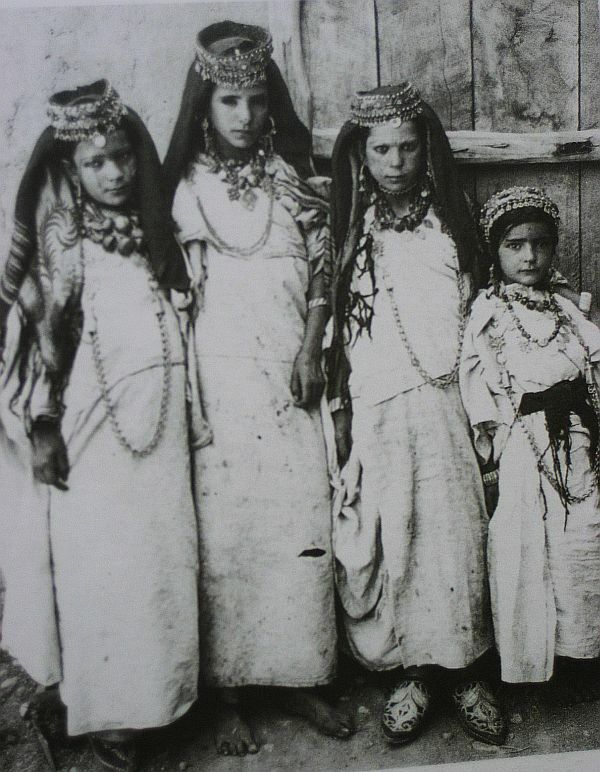 Jewish Berber girls. Courtesy of Juifs Berberes. Four months later, a deal was struck for a larger emigration. King Hassan, embarrassed by the international attention paid to the Egoz drownings, agreed that Moroccan Jews could emigrate secretly, so as not to draw the attention of anti-Israel governments—and the king would receive an indemnity for each Jew who left. The figures were never released, but it is estimated that between $5 million and $20 million flowed to the royal treasury in exchange for the 80,000 Moroccan Jews who were allowed to make aliyah between 1962 and 1964. The last Berber Jews left Tinghir and other Berber towns silently, in the dead of night. Word was passed among them; they left with only what they could carry and without telling their Muslim neighbors. They walked, some of them single file down mountain trails, to roads outside their villages. There, they boarded buses to begin their journey to the Jewish state. Of course, before the Islamic conquest most Berbers were Jewish. Of course conversion was less difficult in those days. But now Judeo-Berber is an endangered language. I do not know how much of it has been written down though. More than likely it was a woman's language, which means a great deal was not written down, because the written language was Hebrew. I do not think that Judeo-Berber had a literary renaissance the way Yiddish did. Once at a bar mitzvah in Denver, CO, I discovered my waiter, who looked Middle Eastern, had a Muslim name, and so I tried to talk to him in Arabic. He straightened up and said somewhat indignantly that his language was Berber. He apparently didn't like the Arabs or their language. I met some Berber Jews in Israel; they had settled on a moshav, and I spent a night there on a patrol. They were simple and quite apparently unschooled but very gentle. The description of the Berber Jews' exodus on foot at night from their villages reminded me of another Exodus that took place from another North African country on the Mediterranean over 3,000 years ago. I have heard Amzigh and Tamazight, and cannot make out a single word of what they are saying. I image the only Arabic loan words they have are for mosque and Qu'ran. But the rest of their vocabulary was completely incomprehensible to me. The ancient language of North Africa. The Berber Jews were an anomaly - a mini-culture that managed to barely survive for hundreds of years of isolation from mainstream Jewish life (even by Moroccan standards). The fact that any were re-introduced to the Jewish community at large is a tribute to the communal efforts of Jews all over the world - France, US, and Israel. "Next year in Jerusalem" is only for mostly poor Jews. The RICH Jews stay in America, like they did in Babylon over 2000 years ago. We NEVER hear about the POOR JEWS in Israel and those who are 2nd & 3rd Class citizen. The DARKER you are, the less chance you have of getting on. Why are Jews such HYPOCRITES? Have they learnt anything from history? In reply to Larry Silverstein that mostly poor Jews make aliya is a total fabrication o the truth. There are many wealthy Jewish families that have made the decision that they want to live in the Jewish State of Israel for many reasons including that of religion. To state that the darker the skin that you are, you will face greater hardship in life than if you possessed a lighter color is a total fabrication of the truth, you are what you make yoursel to be. It just so happens that a 21 year old girl, a recent Ethiopian immigrant to Israel has just been crowned Miss. Israel. I visit israel on a regular basis as i have dual nationality, Swiss/Israeli. My late Parents fled our native Aleppo in Syria after the Aleppo Pogrom which tookm place in December 1947, my Parents had business contacts in Geneva, therefore we managed to get visas for Switzerland after the terrible massacre which took place and killed many Jews destroying our homes, Synagogues, and businesses etc. Come on... this is bull...t ! Berbers (E3B3) don't resemble at all people from saudi arabia. Usually north-Africans in the U.S. are often mistaken with Hispanics. And when Berbers move to the U.S. and get the citizenship, the first thing they do it's to change their names. Berbers have nothing, nothing to do with people from middle-east, nothing ! Such as St Augustine and Victor the first, Berbers once were christians. And there were also disciples of Arius. In Europe, they do not change their names. They also were wearing that very distinctive blue and white stripped coat, with a hood. Which is how I was able to recognize them in Europe. I would go down to the train stations in the early morning, and see them all laying out on the floor sleeping.